I DO Believe in Mermaids! I Do Believe In Mermaids!!! Mermaid tails are the best way for your child to become the mermaid that she dreams of. Nothing is better than a child’s imagination. I have always been in awe of their ability to believe. As parents and grandparents we encourage our children’s imaginations. We tell them over and over that they can be anything they want to be. Companies like Suntailmermaid.com understand the need for products to teach our kids and encourage parents to keep their childish beliefs alive. Their motto is “Swimming in Imagination”. When my granddaughter Hailey told me that she was having an eighth birthday party with the theme Mermaids, I knew this was an opportunity that we wouldn’t normally have. I was lucky enough to be chosen. The delight on her face when she opened it made it all worthwhile The instructions were easy to understand and made it a positive experience. Suntail Mermaid Tails knows that the littlest detail can make the difference between happiness and disappointment. The instructions were very clear and easy. Suntails have an open bottom for easy and fast access to legs and feet making it easier to use. The tails are made of high quality swimsuit fabric with 4-way stretch. Suntail monofins do not have any straps that close around the ankles so that they can be easily tugged or kicked off. Suntail mermaid tails are made of regular swimsuit fabric, water flows through easily and the tails do not bog you down. Use under adult supervision. Every effort was make to make these tails safe but an adult within close range is still the best idea. Sun Tail Mermaid’s monofins are extremely comfortable while being virtually unbreakable. Their patented monofin is comfortable and functional. They provide propulsion and control. The monofins come in a wide range of beautiful colors. Just seeing the smile on her face tells me that her fantasies can come true. I will still encourage her to be everything she can be. But a mermaid today is a dream come true. Now that you have seen what this product can do, you must check it out. There are also products for boys and girls and accessories to match. I received this product to review. No money was exchanged. Photos are my property. Make your little girls dream come true! 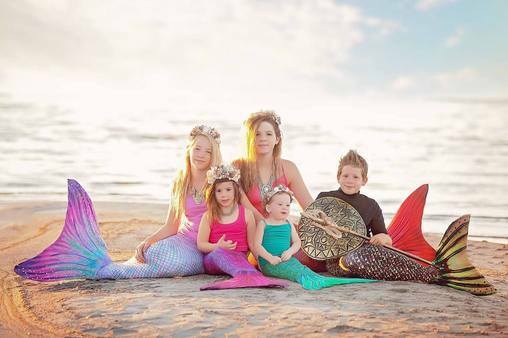 Sun Tail Mermaid has created the world’s best swimmable mermaid tails and mermaid flippers. Their mermaid tails are soft, comfortable, and come in a wide variety of designs and colors. They are made of high quality swimsuit fabric with 4-way stretch. Sun Tail Mermaid’s monofins are extremely comfortable and virtually unbreakable. Their patented monofin is several steps ahead of everyone else in engineering, durability, comfort, and functionality. The propulsion and control is exceptional. The monofins come in a wide range of beautiful colors, so you can match your mermaid tails or look amazing wearing it alone. I am the world’s worst procrastinator. I wanted to restart my blog but instead put it off until a year has passed. I love my blog but I am at a loss to find what I need to motivate me to continue. I know a lot of bloggers who manage to find time to take care of a family or work full time. I am not sure if that is what I can do. I love blogging but taking this first step was so hard. I will try to make it all work. It is important to me. I enjoyed my time reviewing products. It was so much fun and I got free stuff!!! Everyone loves free stuff. I will try to get all of this to start again. I can do it. Baby steps. Thanks for being part of my blog audience. I bought my Microsoft Surface Pro 3 two years ago. The only thing I missed was a dvd player/recorder. I was very happy when I was asked to review the Novapolt DVD and CD drive. It works like a dream. Not only is it lightweight but it has the USB cord attached and neatly tucked away on the underside. I plugged it in and had no problem getting it to work. Easy, portable and amazing. No need to install any driver program. Just Plug and Play. I love taking my laptop with me and this portable drive makes it easy to have everything with me when I need it. It will fit into my laptop case and I will hardly know I have it there. I received this product free or at a discounted price. All opinions are my own and the photos are mine. This is a wonderful addition to any liquor cabinet. The elegance from the suede type bag to keep it in along with the beautiful craftsmanship is in a class of its own. The stainless steel shaker can hold 25 oz. and is easy to hold and pour. It has a tight fitting lid so you have no leakage. Also dishwasher safe so clean up is a breeze. The included 1/2 and 1 oz. jiggers lets you get your measurements down for the perfect drink. Two pour spouts are included to complete this set. I can think of so many people that I can gift this to at Christmas. The suede bag cinched it for me. Add in the Lifetime Warranty and you know you have made the right choice for yourself or someone you care about. I received this product free or at a reduced price for my honest review. All opinions and photos are mine. Love my hands free holder! Amzshark has come up with a great idea. It is a handsfree cellphone holder stand. Clipping it onto your table and adjusting the coiled cable to just the right position makes it so easy to do what you need to with your cellphone and continue to use your hands for something else. I personally love doing reviews. Occasionally I need to make a video while actually using a product. I have never had luck with trying this by myself. With this stand it has never been easier. I adjust the coiled cable and place it where it can record and do it by myself. Not only do you get this cellphone stand with the clip, but you get a great little stand for your desk or table. It has a kickstand that adjusts at so many different levels that you can get your phone to that perfect point for you. I love gadgets of all kinds. These are right up my alley. They are some that I would actually use and I recommend them to anyone who loves to watch videos and other things on their phones. No more tired arms. They are affordable, durable and pleasing to the eye. The only holder you will ever need. Check them out at Amazon. I received this product at a reduced price in exchange for my honest opinion. All opinions in this post are my own along with the photos. As one of those persons who hate to taste the plastic on a water bottle not to mention the disposal problem, this insulated bottle was made for me. I love it. This one is 18 oz. stainless steel with three different caps to suit whatever you want to carry and how you do it. Liquid Savvy’s insulated bottle is double-walled and has a wide mouth on it so you can use it everyday. You can take soup to work, cold water for a walk or bike ride or use up leftovers from last night. This is the perfect bottle for you. My favorite part is the three different lids. I love hooking things on my purse or backpack because my hands are always full. I have a choice with these lids. Most bottles give you one. That’s why their motto is Smarter Beveraging. Liquid Savvy has a 100% warranty. No hassles. But your won’t want to return this. It is smart in looks and functionality. I received this product for a reduced price to post my honest review. All opinions are my own and the photos were taken by me.